Web.com—How Do I Update My WHOIS Contacts? Important: This article applies to Web.com customers only. You can edit and make changes to your WHOIS contacts in your Account Manager. 1. Click here to log into your Account Manager. The Home page of your Account Manager appears. 2. 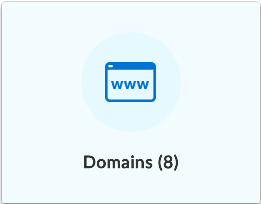 Click the Domains tile. In the Actions column, click the drop-down arrow, and select Contacts. 4. Click the Contacts tab to view the WHOIS contacts associated with your domain. 5. Click the Edit button. To apply updates to your other contacts, check the applicable box next to the contact. 6. In the Edit Registrant Contact form, make any changes to your existing information. 7. Click the Save Changes button. Note: If the Registrant information is updated, then an email is sent to the prior email address to get authorization before the new email address is applied—referred to as the Change of Registrant (COR) process, mandated by ICANN. COR ensures the owner of the domain does not lose it if someone gets into the account without authorization and attempts to change the Registrant information. Web.com—What Are the Types of WHOIS or Domain Contacts?